The Doepfer MS404 was designed as a TB emulator with a lot of added features in a period full of cheap and expensive tb clones. The 404 in fact is not a clone but has a clear personality and can be considered more a single VCO monosynth. First I want to describe the structure of the synth: a single VCO , with saw/pulse/PWM or noise with a 24dB ladder filter, a VCA with accent and a adsr Envelope generator and two indipendent LFO that can go up to audio frequency! The VCO seems to be the A110 “standard vco” available as a module for the A100 modular system, but opening the case , I read on the board “HI END VCO”,and that sounds strange because I did not see any CEM3340 as on the A111 “hi end VCO”. The VCO section has 5 knobs and 3 swithches. Knobs are: GLIDE, TUNE (fine tune) , LEVEL (LFO1 amount) FREQ (LFO1 rate). and 2 switches : one for the filter tracking and omne for the LFO2 range (hi-mid-low). The VCF is the same as the A120 MOOG ladder filter eurorack module for the A100. The VCA has a knob control for the accent amount and the envelope is the classic adsr. speaking about the sound the 404 has a distinct doepfer carachter, it sounds exactly as the A100 modular system, no audible differences. The synth behaves as a tb clone if the added features are not used, and with the emphasis quite low. When you rise the emphasis it takes squelching in a more hard way and at self oscillation it can produce a sine wave , musically playable switching the filter tracking ON. It does not sound nor similar to a Roland SH-101, this is more acid and hard, the SH is fuller on low frequencies and smoother. The interesting feature that makes the doepfer ms 404 a distinct machine is the use of fast lfo to modulate VCO and VCF. The LFOs are derived from the A145 (doepfer A100 system) and have a range switch that allows very low oscillation to fast audio range FM. Using the other LFO on the VCO can create some interesting noise or FM sounds useful for percussions, drones etc. The waveform orf the LFOs are fixed, triangle or square and you can choose the one you want to use only using a jumper on the board, there are no external switches. The impression I had playng the MS 404 is really good. This is a interesting bassline synth , not so good at emulating the classic TB sound, but this is a good point! Other than that can be used as a classic monosynth with a great modulation capability, and many sounds with a small amount of functions and knobs. There is also an audio in (with gain) to process external audio signals and a cv-gate interface (in/out) so the 404 can be played trhu cv by an analog system/sequencer or can be used to control other cv-gate synth. I prefer the 404 to a Basstation , for example , it sounds more interesting and “analog” and is not the “wannabe everything” emulator. The Roland TR-606 was the cute sister of the great TB-303. Roland intended to sell this pair of silver boxes to guitar players or organ players as substitutes to a bassist and a drummer. But in the early 80s , when the popularity of sample based drum machines was growing up with the Linn drum, Oberheim DMX, Emu Drumulator, the TR-TB combo sounded really poor and unnatural to rock players who were astonished by the fidelity of the sampled sounds. So the poor silver boxes were sold just for practicing musicians on a budget. During the 80s many electronic bands with low budget started using both the 606 and the 303 till , in 87/88 DJ Phuture enstablished the sound of the TB-303 as a new mainstay in the dance culture. The TR606 , often used in early new wave electro-bands became famous as a great techno drum machine, along with its bigger sisters the TR 808, TR909. 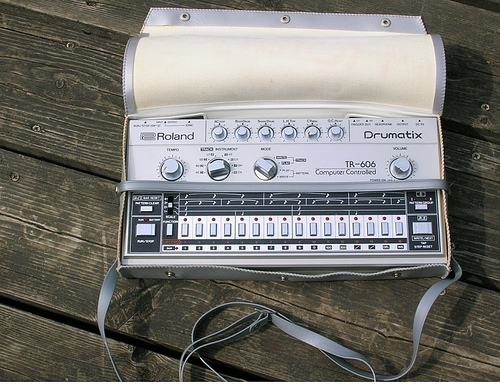 The TR606 is a fully analog drumsynth with a digital sequencer. The machine has seven sounds plus accent. The sequencer is really pretty easy to use. It can be programmed in Step or Realtime, and is the classic 16 step TR sequencer. You select the instrument and press the step that corrispond to the trig you want. Really easy and user friendly! The sequencer can also be used trig synth arpeggiators or other old machines with sync in. The two toms have two triggers out to do it. The 606 has a din port to sync (in or out ) with other machines that use the Roland sync 24. The sounds are typical electronic analog sounds very close to the TR808, but with their own carachter. The TR606 has a more aggressive and less smooth tone compared to the 808, it could be the 808 on acid! The bassdrum kicks in a medium range, the snare is hard and snappy the hats and cymbal are really tinny, while the toms are great for that tribal electro rhythm. This is a great analog drum machinee that’ is growing in price and popularity, I love mine and I think any electro/techno producer should own one! The waveforms of the Roland MC202 at the oscilloscope. The background noise / aliasing is generated by the youtube compression. 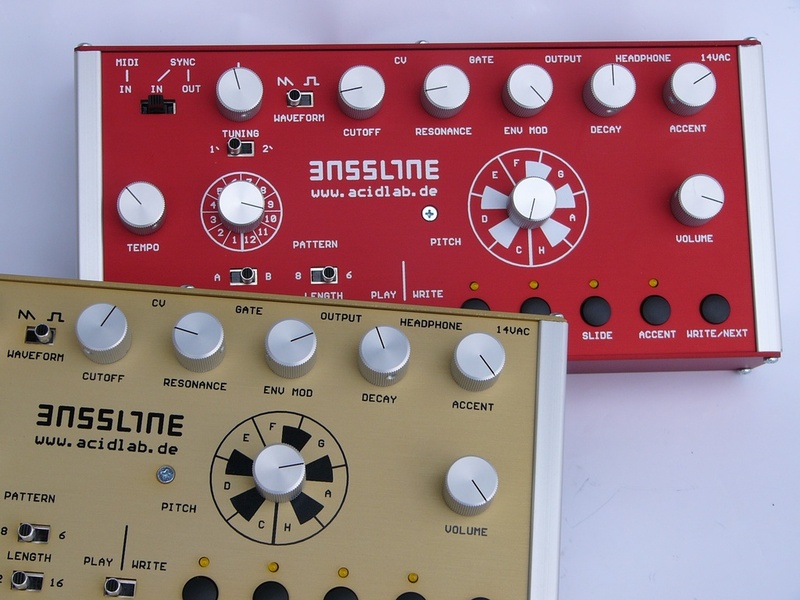 Acidlab Bassline – everybody needs the acid box! This little alluminium box, absolutely handcrafted, comes from Germany as a clone of the famous TB-303. The ACCENT is a really “playable” part of the synth as it creates a “tenuto”on the selected note and and the decay get disabled for that step, and get the filter to open and the rises up the Volume. The Sequencer programming is not so easy as it seems and often leads to strange ipnotic sequences. The Acidlab Bassline has an identical structure for the synth, with the same knobs and functions, while the sequencer is not the same as on the 303. The knobs are really good and act smooth , they invite you to twist the sound! The sequencer works in a different way, first it has a 8-12 selector to choose if you want a 16th note pattern or a 12th. You cannot chhose the lenght (step ) of the pattern, for example 9 steps. The programming is really particular because here there’s no minikeyboard, a knob switch is used to choose the note, you hit play and the bassline lets you hear the note selected, then you select accent and/or glide and /or 1octave upand than press next to go to the following step. With this method you can get, with a bit or a lot of “randomness”, really interesting sequences without having the situation too much undercontrol. Another difference from the 303 is that the sequencer does not change pattern at the end of the loop, but jumps immediately in the selected pattern. This can be a creative tool to mix several pattern togheter making more complex melodies, but it’s not possible to compose a chain of pattern in song mode or something realtime like a chain of pattern. Another interesting add is that the sequencer can drive external analog synths with cv-gate outs and can be syncronized to older machines with din sync and to a daw or midi sequencer thru midi, always with a perfect timing. Analizing the “sound” of the Acidlab , the knobs are the same as the 303 but this machine has a kind more aggressive carachter. It sound quite mellow when the resonance is absent, and with the filter closed can do amazing subs, while as we turn up the resonance it became acid more and more aggressive but when the reso overflow the 75% it starts sounding more industrial than the classic TB. To change the behaviour of the resonance there is a trim pot on the rear to adjust the response , to be similar to the orginal or to have more reso. The machine can really sound close to the original but has even its own carachter and that’s the reason why I like it! The strange sequencer is really interesting and when you ‘ve got deep into the way it works it will be an “exclusive” creative tool.